The Boston Square shown here explores four management territories, and their impact on Knowledge Management. The two axes of the square are management by power v management by empowerment (i.e. how much the leadership operates through hierarchy and through fear, rather than through inspiration and enablement), and the levels of internal cooperation v internal competition (usually reinforced by reward and recognition schemes). Where there is strong internal cooperation, and management by empowerment, then Knowledge Management will thrive. Where there is strong internal competition, and management by empowerment, then Knowledge Management will find things more difficult. 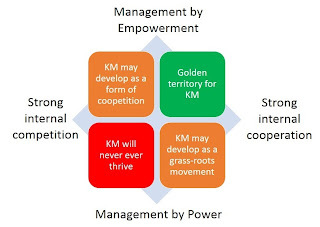 Leaders can, if they try, use KM as a sort of coopetition tool, where the groups will cooperate to a certain extent through knowledge sharing and re-use, but there will still be internal competition regarding the application of that knowledge. This is a difficult line for leaders to tread, as the internal competition can be used as an excuse not to share with and learn from each other. 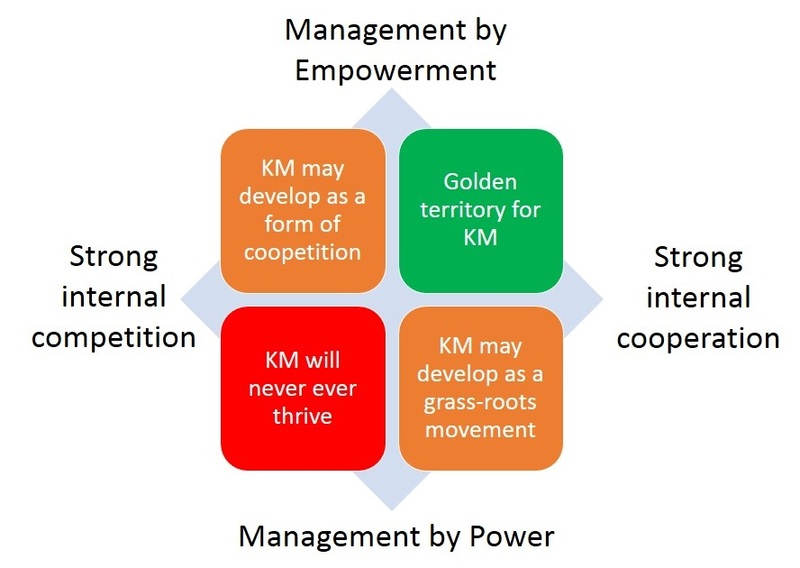 Where there is strong internal cooperation, and management by power, then Knowledge Management will find things more difficult, and KM may arise in unexpected ways. Here KM can go underground, and can become a way for the workers to share knowledge without the managers knowing. I have seen this happen in organisations, where the communities of practice become "grumbling shops" or even spill over into revolt. You can see an extreme geopolitical version of this in the recent activities in Egypt, Tunisia, Libya, Yemen etc. where Government by Power meets a collaborative and networked populace. Where there is strong internal competition, and management by power, then Knowledge Management will never take off. Everyone will keep their knowledge to themselves.